Young dairy scientists are offered the opportunity to pitch their exploratory work to the nation’s leading dairy farmers as part of the Australian Dairy Conference (ADC) ‘Young Dairy Scientist Award’ in Canberra, February 2019. Forming an integral part of the annual Conference two-day proceedings, the ‘Young Dairy Scientist Award’ has become an esteemed pathway for aspiring early-stage dairy scientists providing an environment to present, discuss and connect with pioneers and innovators of the national dairy industry. ADC Scientific Director and ‘Young Dairy Scientist Award’ Coordinator Richard Rawnsley said that the initiative provides a ‘competition with a difference’ for many young researchers with a focus on communication as a central part of the Award process. “The Award is designed to nurture scientific excellence with communication prowess and the young scientists must convince fellow dairy farmers and scientists that their research is soundly based and has exciting implications for the future of the dairy industry,” he said. “Five finalists selected from a submission process will be required to present to Conference, host a display exhibit and submit a popular press article for publication (The Australian Dairyfarmer). As a result, the focus is very much on how they communicate and express their body of work,” said Mr Rawnsley. “Scientists will be judged mainly on their ability to deliver a message that makes their research understandable and relevant to the audience primarily made up of dairy farmers and service providers,” he concluded. A $3,000 travel bursary prize is awarded to the winner to attend a scientific or dairy conference of their choice. A judging panel at ADC Canberra 2019 will determine the winner with full conference registration provided to selected finalists. Mr Rawnsley said that the ‘Young Dairy Scientist Award’ has become extremely valued by Conference delegates and the scientific sector alike for the insight and range of topics on display and their application to on-farm practices. Judged at the Australian Dairy Conference, 20 February 2019, Canberra, ACT. Entries close Friday 2 November. Finalists notified by Friday 9 November. Conditions apply. Applicants must have completed a recognised unit of study within the past five years to be eligible. Please see more information and conditions of entry is available in ADC Young Dairy Scientist 2019 information pack. 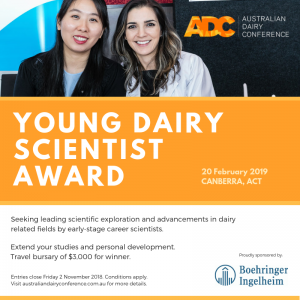 The Young Dairy Scientist Award for Canberra 2019 is proudly supported by Boehringer Ingelheim.